Since we started working on the Bonus Room Home Theater, the bathroom up there has been driving me nuts. It’s the same colors as the original bonus room, but it completely clashed with the new color scheme. I’ve been struggling to come up with some awesome design for in there, but couldn’t come up with anything. I finally decided to just get it painted and go from there. 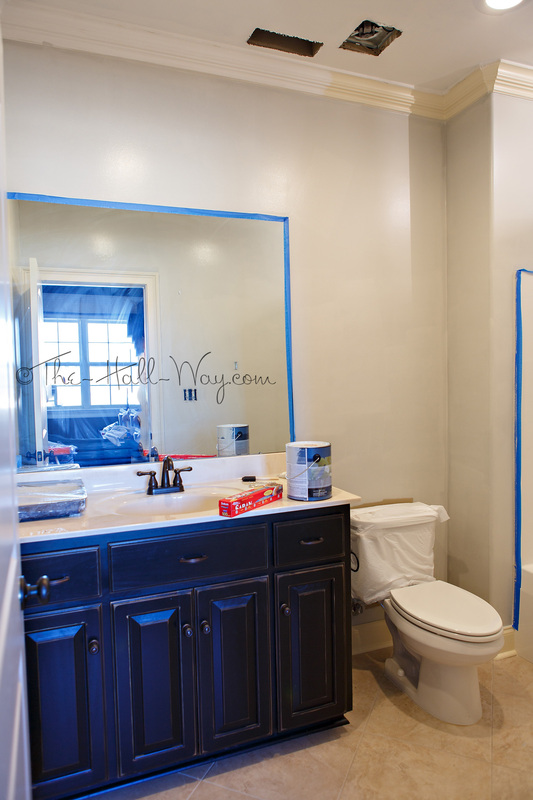 The ceiling became Behr Silky White – the same as the majority of the house. 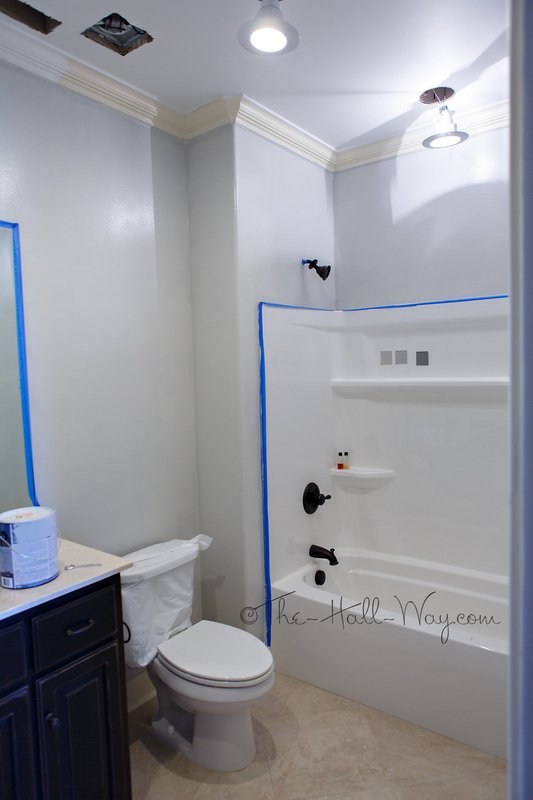 I didn’t want to use Behr Silver City on the trim and ceiling like in the bonus room because, while being a large bathroom, it is still windowless and I wanted something brighter and clean. 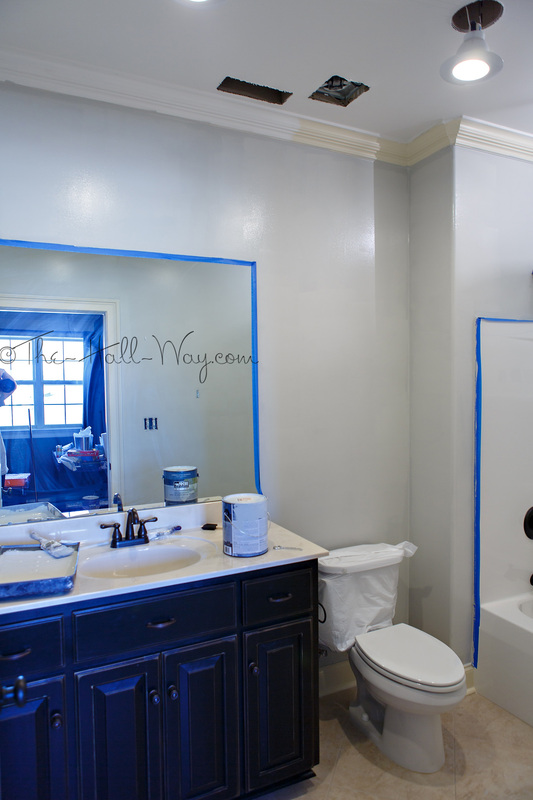 For the walls, I chose Behr Dolphin Fin in Satin. 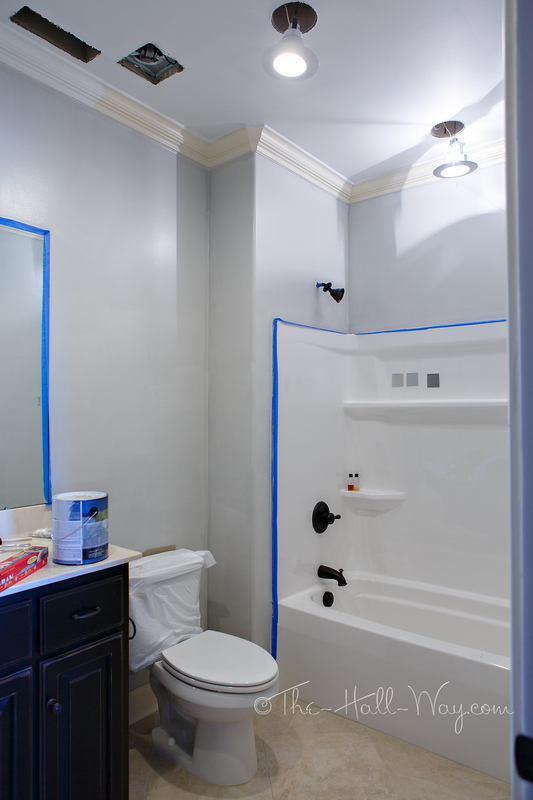 It is a pale grayish blue – similar to our Master Bedroom. First Coat . . .
Second coat (still wet which is why you can see the edge lines) . . . 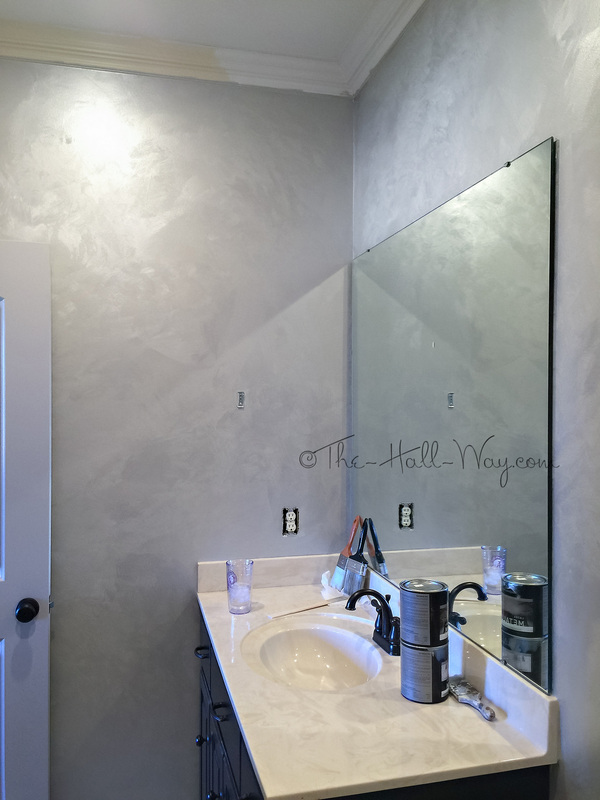 It turns out that faux finishes apparently aren’t as popular as they were a few years ago. 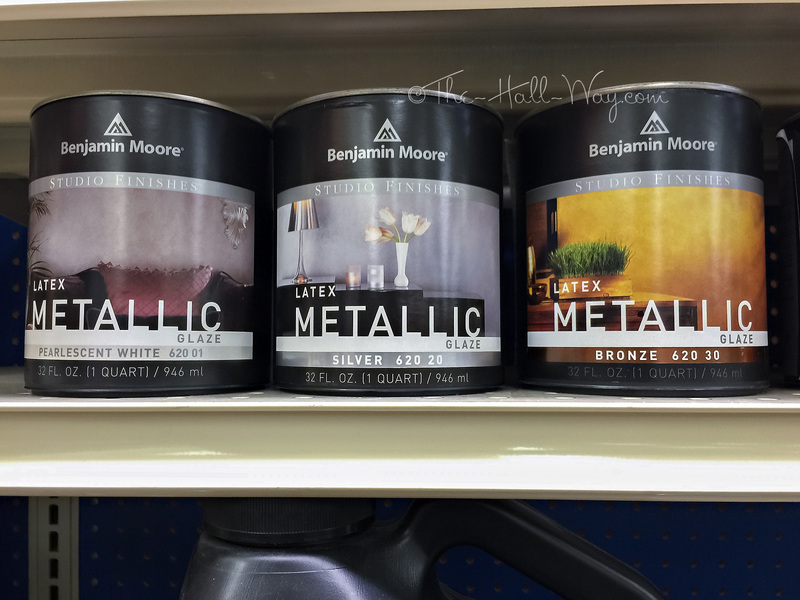 I went out in search of some metallic paint or glaze and had a horrible time finding any. 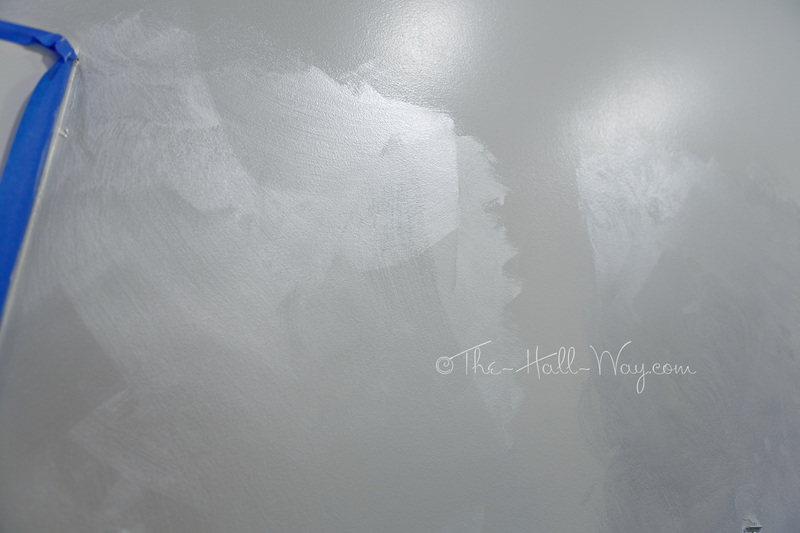 Benjamin Moore was the only place that had it in silver and it wasn’t cheap. I picked up a quart of Silver and Pearlescent White figuring I could use whatever was left on other projects. 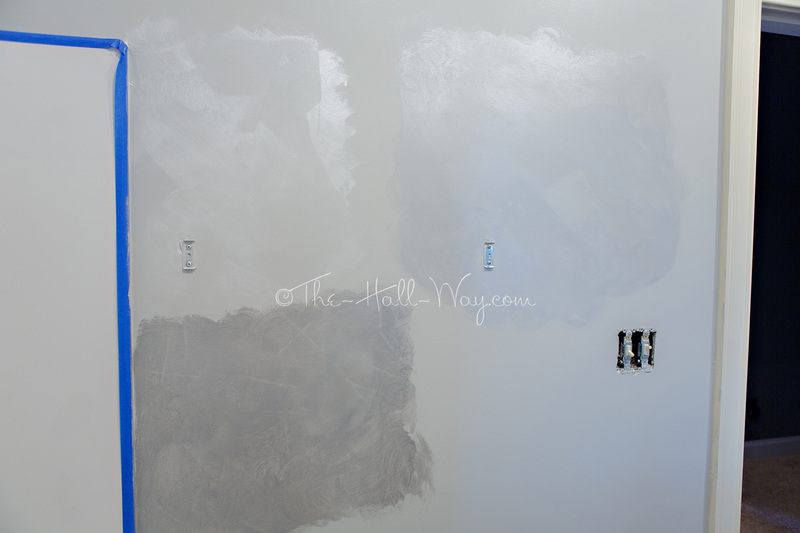 I painted some swatches over the new wall color. I “scrubbed” the glaze on with one paint brush, then used a large 4″ brush to smooth out the lines and make it more subtle. The swatch on the right is an approximate 50/50 mix of the Pearlescent White and Silver. It was hard to get a good picture of, but here’s a close up of the white. I decided the white was too subtle, but the silver alone was darker than I wanted. Good thing I bought both! The finished walls almost look like wallpaper. Took some time, but it’s growing on me. You can see the trim is still the original color. I knew this was coming, but a result of the new colors was that the countertop now stood out. 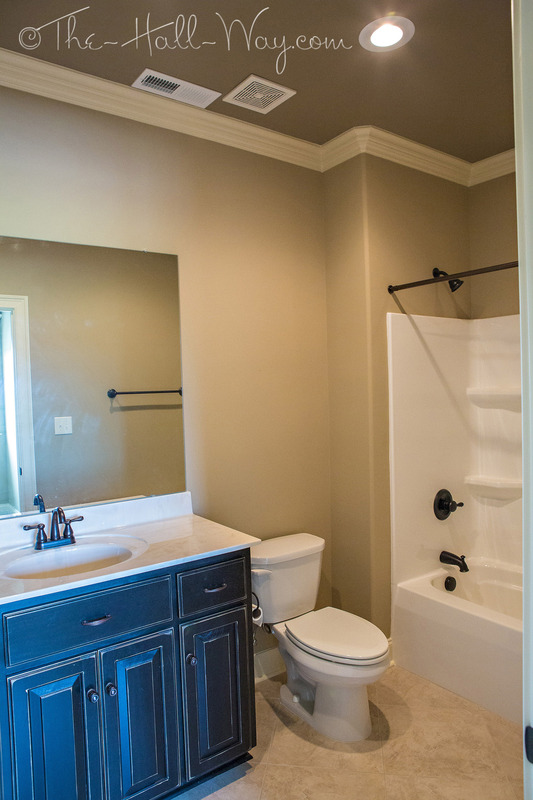 The tub and toilet are white, but the counter was ivory cultured marble. 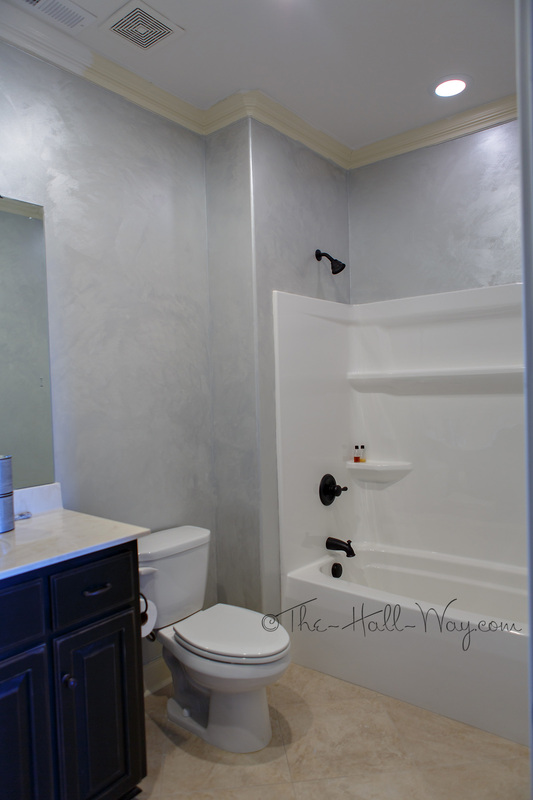 The white trim and silver walls made it look dingy. My first choice was to replace it with granite, but this is a 48″ vanity and even a remnant wasn’t going to be cheap. I could get the identical white cultured marble counter for less than $150, but wasn’t crazy about that idea either. What to do?